Includes Black Wii Console, Black Wii Remote Plus, Black Nunchuk, Wii Sports and Wii Sports Resort. Wii Sports Resort takes the inclusive, fun and intuitive controls of the original Wii Sports to the next level, introducing a whole new set of entertaining and physically immersive activities. With the deep control enhancements of Wii MotionPlus, veteran Wii users and newcomers alike can enjoy unprecedented gaming precision as they cruise on a water scooter, duel with swords, throw a Frisbee and much more. The Wii with Wii Sports Resort and Wii Remote Plus Controller bundle is an expansion of the motion controlled video gaming revolution that Nintendo began with the release of the Wii console back in 2006. The bundle consists of a stylish black Wii console, matching black versions of the ultra motion sensitive Wii Remote Plus controller, Nunchuk controller, and a copy of both Wii Sports Resort and the original Wii Sports game. The console supports all former controller configurations used by Wii and with the now standard advanced capabilities of the the Wii Remote Plus controller provides new and more experienced player with the ultimate new way to start or expand a Wii party in their homes. As with every console, much of the buzz about Wii revolves around its specs. The Wii boasts 512 MB of internal flash memory, two USB 2.0 ports, and a slot for SD memory expansion. The system's technological heart -- a processing chip developed with IBM and code-named "Broadway" and a graphics chipset from ATI code-named "Hollywood" -- deliver stunning performance. And instead of a tray, Wii uses a single, self-loading media bay that plays both 12-centimeter optical discs used for the new system, as well as Nintendo GameCube discs. An additional, and often overlooked, benefit of the Wii is that it uses a fraction of the power of other current gaming consoles on the market, saving energy and money both when it is on and off. The ultimate Wii Sports bundle. The functionality of the original Wii Remote and the Wii MotionPlus accessory in a new single controller. 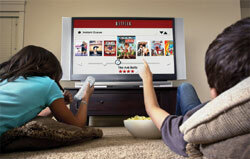 Wii Channels and functionality fit for the whole family, including Neflix streaming, now without a disc. Wii is all about the motion controlled freedom and flexibility, and the new Wii Remote Plus Controller, included in this bundle in a matching black color scheme, is the new standard controller for the Wii gaming system. Combining the original accelerometer enabled motion-sensing abilities of the original iconic Wii Remote controller with with the expanded capabilities that were once only accessible through the Wii MotionPlus accessory, the compact Wii Remote Plus controller offers players precision motion controls all in one unit. Additional Wii Remote Plus controllers, in various other colors, are available for separate purchase and Wii continues to support all previous Wii controller configurations. This console bundle also includes a matching Wii Nunchuk, which adds an analog thumbstick and trigger buttons, and like all Wii console releases, the system allows for up to four controllers to be linked at a time and utilizes standard Bluetooth wireless technology. Mii Channel - Miis are cute little caricatures you create to use as characters in a variety of Wii software. Store Miis on your Wii or load them onto your Remote and take them over to a friend's house to use on their Wii. Everybody Votes Channel* - The Everybody Votes Channel is packed with national and worldwide polls. Answer interesting questions and have your say. Up to six members of your family can vote. Just choose an answer and check in later to see the results. News Channel* - Wii might be great for games, but you can also use it to get updates on the latest news from across the Internet organized into easy-to-browse categories. Forecast Channel* - Your Wii can automatically update you on the weather from around the globe. Wii Shop Channel* - Download the Opera web browser and access games from classic consoles from the past. All you need is a Wii Points account. Virtual Console - Every Virtual Console game you download from the Wii Shop Channel appears in the Wii Menu as a separate Channel ready to select and play any time you like. Wii Message Board - Leave or receive messages for other family members on the calendar-based message board or use WiiConnect24 to send messages to people outside your home. Internet Channel* - Just download the Opera browser and within minutes, you'll be a professional sofa surfer, pointing-and-clicking your way around the web with your Wii Remote Plus. Photo Channel - Show off all your digital photos on your TV. Just insert an SD memory card into your Wii and away you go. Disc Channel - The Disc Channel is backwards compatible with Nintendo GameCube, so you can play all your new Wii discs, along with all your classic Nintendo GameCube discs too. Check Mii Out Channel - This is the place for Miis to mingle. You can show off your Mii creations and download Miis that others have created. You can also participate in Mii contests by creating and judging Miis for a specific contest theme. Nintendo Channel - This is your own interactive guide to what's new in the world of Nintendo, including trailers, mini-documentaries, product demonstrations, gameplay videos and much more. First and foremost Wii is a gaming console. In addition to the two games bundled in this console release, Wii also plays games developed specifically for it as well as fan-favorite games from Nintendo's 20-year-old library. Its drive is compatible with GameCube discs, and select Nintendo titles from the original NES of the 1980s all the way through the Nintendo 64 are available for download through the "Virtual Console" for $5 and $10 respectively. To support this backwards compatibility the Wii includes four ports for classic Nintendo GameCube controllers and two slots for Nintendo GameCube Memory Cards. As if that weren't enough, the Virtual Console will also make available a few titles from SNES console contemporaries, Sega Genesis and TurboGrafx 16. Striking Hardware - Bundle extras include matching limited edition black Wii Remote Plus controller, Nunchuk and Wii console hardware. Two Great Games - Enjoy your own copies of both Wii Sports Resort and Wii Sports, right out of the box. Intuitive Controls - Intuitive controls utilizing the physical motion of the Wii Remote Plus. Up to four Wii Remote Plus or standard Wii Remote controllers can be connected at once using wireless Bluetooth technology. The wireless signal can be detected within 10 meters of the console. Both the Wii Remotes and Nunchuk controllers include motion sensors. 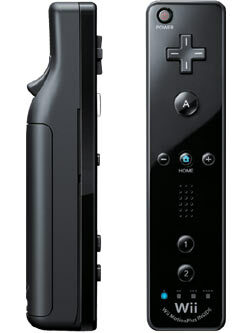 The Wii Remote Plus and Wii Remote controller also include a speaker, rumble feature and expansion port, and can be used as a pointer within five meters of the screen. Wii Channels - The Wii Menu is the main gateway for a variety of easy-to-use, interactive multimedia, entertainment and communication functions. Memory Expansion and Ports - The Wii console has 512 megabytes of internal flash memory, two USB 2.0 ports and built-in wired and wireless broadband Internet capability. A bay for an SD memory card (sold separately) lets players expand the internal flash memory and launch downloaded games directly from the cards. In addition, the console contains four ports for classic Nintendo GameCube controllers, two slots for Nintendo GameCube Memory Cards and an AV Multi-output port for component, composite or S-video. WiiWare and Virtual Console - Along with games on disc, Wii owners gain access to a world of downloadable games via the WiiWare and Virtual Console game services using purchasable Wii Points. Parental Controls - Wii features easy-to-use parental controls that allow users to manage access to Wii game software based on the ESRB rating, restrict access to various channels, limit the ability of users to send and receive messages or prohibit the use of Wii Points in the Wii Shop Channel. Dead-on accuracy with the Wii Remote Plus controller. A whole new range of games. Wii Sports Resort is an immersive, expansive active-play game that includes a dozen fun resort-themed activities. It maintains the wide-ranging appeal that attracted millions to the original Wii Sports. The game is easy to pick up and play, but comes coupled with deeper levels of play that are sure to challenge even the most experienced gamers, whisking them away to a resort that's full of action, while introducing an unprecedented experience in physical reality. Utilizing the advanced motion-sensing capabilities of the Wii Remote Plus controller, included in this console bundle, or a player-provided original Wii Remote/Wii MotionPlus accessory controller combination (both sold separately), players experience the most realistic, immersive experience possible - where the slightest tilt, turn and twist of a controller is recognized. From the moment players skydive onto Wuhu Island, they're presented with a huge selection of fun activities that everyone can play. Wuhu Island has so many things to do, there's never a dull moment. A dozen activities await visitors: Archery, Frisbee, Basketball, Cycling, Canoeing, Power Cruising, Table Tennis, Air Sports, Bowling, Swordplay, Golf and Wakeboarding. The activities use the precision controls of the Wii Remote Plus controller or Wii Remote with the Wii MotionPlus accessory to help players come much closer to the physical reality of engaging in the actual sports. Every real-world action, whether it's a perfect drive on the fairway or a slice off the course, is meant to be faithfully replicated. Each activity has multiple fun challenges designed to keep visitors coming back for more. Basketball players might compete in a three-point shootout or jump into a three-on-three pickup game. Archery enthusiasts must aim for the bull's-eye across ever-increasing distances and obstacles. Different activities use the Wii Remote Plus/Wii Remote and Nunchuk controllers in different ways. For example, players hold the Remote like a paddle in Canoeing, while in Cycling they use both arms to "pedal" with the two controllers. Every nuance of motion is picked up and translated onto the TV screen. Pick up and play fun in every game. One of the most popular Wii party games of all time, Wii Sports offers five distinct sports experiences, each using the Wii Remote / Wii Remote Plus controller to provide a natural, intuitive and realistic feel. Players can use their own Mii caricatures in the game and play them against their friends' Miis for a more personalized experience. As players improve, their Miis' skill levels will increase, so that they can see exactly how much better they've become. Tennis (1-4 players) - Players grab the Wii Remote Plus like a racket and swing - the game registers forehands, backhands, volleys, lobs, slices, spin and power depending on how fast the user swings and at what angle. Don't worry about moving around the court to get to the ball - the game automatically moves players into position. Baseball (1-2 players) - Players grip the Wii Remote Plus controller like a bat and swat fastballs out of the park, or fire a fastball over the plate with a flick of their wrist. Timing and bat speed will make all the difference between going yard and whiffing, so keep an eye on the ball and swing for the fences. In the two-player game, one player pitches and the other bats - all fielding and running is automatic, so that players can focus on the action. Golf (1-4 players) - Step up to the tee, hold the Wii Remote / Wii Remote Plus like a golf club and swing naturally to smack the ball onto the green. The harder players swing the club, the farther the ball will fly. Be careful, though - if players swing too hard, their ball will fly out of control, so they should be sure to take some practice swings before going for the pin. After reaching the green, line up putts carefully, practice the stroke and try to hole out. Bowling (1-4 players) - Players raise the Wii Remote / Wii Remote Plus in their hand just like a bowling ball, and then swing their arms to roll the ball. The speed of the swing and the angle at which they release the ball affects the ball's spin, so it will take some practice to master control over the ball and knock down the pins. Boxing (1-2 players) - Using the Nunchuk controller as one glove and the Wii Remote / Wii Remote Plus as the other, players dodge, weave and punch their opponents. Players hold their hands high to guard their faces or low to block their torsos. They punch high to hit their opponents' faces or low to get under their guard for a body blow. Swing both arms left or right to sidestep oncoming blows and move into position for a devastating knockout. 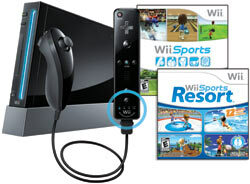 1-Nintendo Wii game console (black), 1-Wii Remote Plus controller (black), 1-Nunchuk controller (black), the original Wii Sports, Wii Sports Resort, 1-wired sensor bar, 1-power cord, 1-standard composite cable, 1-console stand, 1-console manual. * Access to some channels may require your Wii needs to be set up with WiiConnect24.